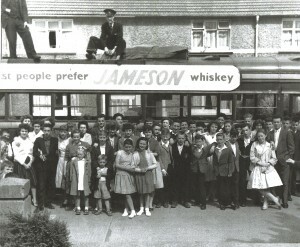 The Starlight Variety Group and the Cabra West Boys Accordion Band on their way to a show in Trim, County Meath on the 30th August 1959. The bus however broke down on the way. This proved no challenge to the boys and girls from Cabra West who settled down to lunch and a sing-song while they waited for a replacemnet bus. Many thanks to Beatrice Kelly for supplying this photograph and information.